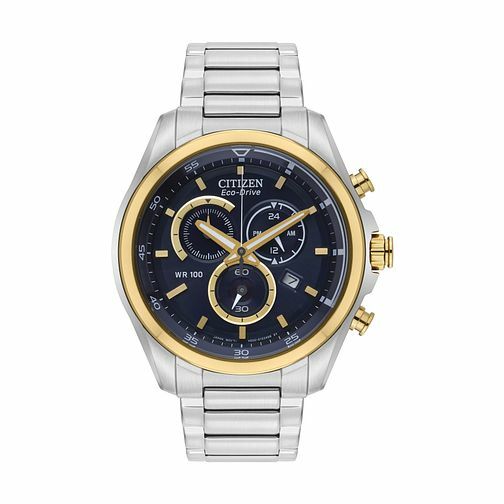 This Citizen Eco-Drive men's stainless steel bracelet watch is perfect as an everyday timepiece. With its distinctive gold plated bezel and gold coloured hands and dial features, this watch is sure to make an impression. The dial also features sub dials displaying 24-hour time and a discreet date window. This watch is water resistant to 100 metres. Citizen Men's Eco-Drive Stainless Steel Bracelet Watch is rated 5.0 out of 5 by 2. Rated 5 out of 5 by Anonymous from Amazingly Excellent A lovely watch that looks great and is simple to use. It also has a 5 year guarantee!